The shortest distance between Chennai and Shravanabelagola is 495 kms(309 miles), you will need around 7 hours to travel Shravanabelagola by Road. 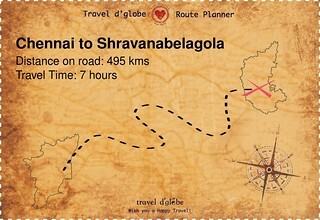 Driving directions to travel to Shravanabelagola, for the roadtrip to Shravanabelagola from Chennai is provided with the map. Shravanabelagola is known as Jai Gommaṭesvara and ideal time to stay there is 1 - 3 days. Find out the 5 places to visit in Shravanabelagola, and what to do there. You may choose to hire a cab to Shravanabelagola from Chennai, railway station or airport. You can book a taxi/cabs like Indica, Micra, Indigo, Dzire, Etios, Innova, AC Tempo Traveller from Chennai and luxury cars for your weekend getaway, holiday destination, honeymoon, family outing, pilgrimage etc. You can check the taxi fare and estimated cab cost for Chennai to Shravanabelagola trip. For the round trip (Shravanabelagola to Chennai) Shravanabelagola to Chennai taxi services we again will be happy to serve you. The points of interest in Shravanabelagola are listed here with the expected expenses/tickets/cost and time you will need to spend or experience the activity in Shravanabelagola. To help you plan the trip, all the famous tourist hot spot of Shravanabelagola are listed here. Which is the best Taxi service for Chennai to Shravanabelagola? Why travel d'globe for Chennai to Shravanabelagola? When renting a car for Chennai to Shravanabelagola, its best to book atleast 1-2 weeks ahead so you can get the best prices for a quality service. Last minute rentals are always expensive and there is a high chance that service would be compromised as even the taxi provider is limited to whatever vehicle is available at their disposal. Shravanabelagola is a very popular tourist destination of Karnataka. The statue of Gommateshvara Bahubali at Shravanabelagola is one of the most important tirthas (pilgrimage destinations) in Jainism, one that reached a peak in architectural and sculptural activity under the patronage of Western Ganga dynasty of Talakad Each day you can find many travellers travelling from Chennai to Shravanabelagola, and vice versa. Amongst the numerous ways to travel from Chennai to Shravanabelagola, the most pleasurable mode is to travel by road. For a comfortable journey in luxuriant settings, book our taxi services in most affordable rates.